The artist Georges Seurat is best known for originating the Pointillist method of painting, using small dot-like strokes of color. His art went a step beyond Impressionism. 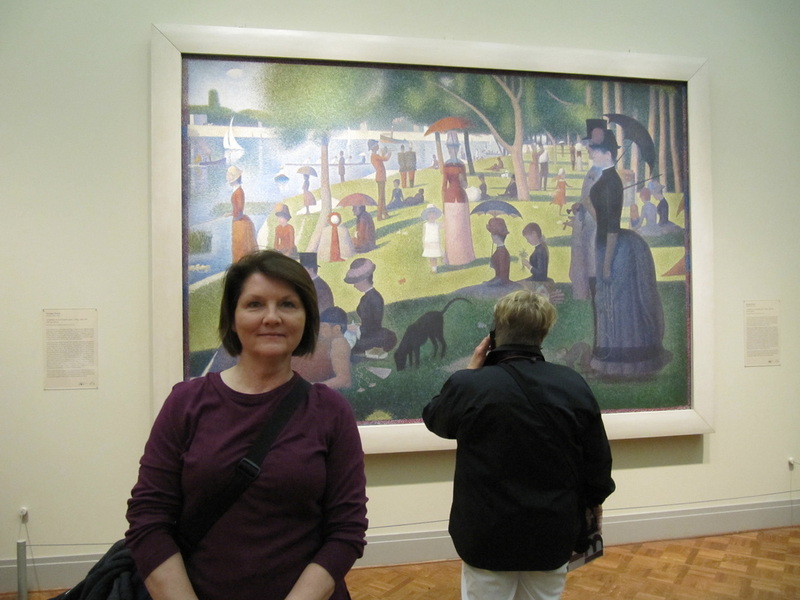 Our painting of the week is Seurat's A Sunday Afternoon on the Island of La Grande Jatte. Seurat was interested in the science of how the eye sees and in color theory. 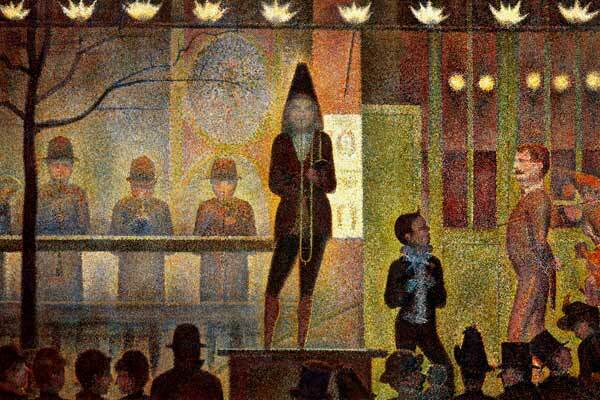 Seurat believed that instead of mixing paint on a palette, it was best to keep color pure and mix the colors together on the canvas by placing small dots of different colors next to each other. For example, to create the color green, he would place tiny dots of blue paint right next to dots of yellow paint, and this creates the illusion of green when the painting is viewed from far away. The eye mixes the colors. He called this way of painting Divisionism. Today we call it Pointillism. Seurat felt that this style of painting would make the colors appear more brilliant to the viewer. Using this technique, he created huge compositions with tiny, detached strokes of pure color. These small dots of color just look like dabs of paint from close-up, but when viewing the entire work from a slight distance, his paintings shimmer with brilliance. In his best-known and largest painting, Seurat showed people relaxing in a park on an island in the Seine River called La Grande Jatte. This island was near Paris and a popular place for recreation, such as canoeing. Seurat visited the island and made many sketches and small paintings to help him prepare to paint his masterpiece. (en plein air - painting outside directly at the site). Seurat worked on the painting in several stages, beginning in 1884 with a layer of small horizontal brushstrokes of complementary colors. Complementary colors are colors that are opposite from each other on the color wheel. He later added small dots, also in complementary colors, that appear as solid and nearly sparkly forms when seen from a distance. Seurat knew that complementary colors placed together seem to vibrate and increase the intensity of light. Complementary colors tend to vibrate when placed side-by-side. Saturday Afternoon on the Island of La Grande Jatte took Seurat nearly two years of non-stop work to complete. Each morning he would go to the scene to sketch and paint. Then in the afternoon, he would return to his studio to paint until late at night. He kept the painting a secret, not wanting anyone to know what he was doing. When Seurat finally exhibited the painting in 1886, people were amazed. Seurat made some final changes to La Grande Jatte in 1889. He restretched the canvas in order to add a painted border of red, orange, and blue dots. Seurat painted multi-color borders on many of his other paintings, too. 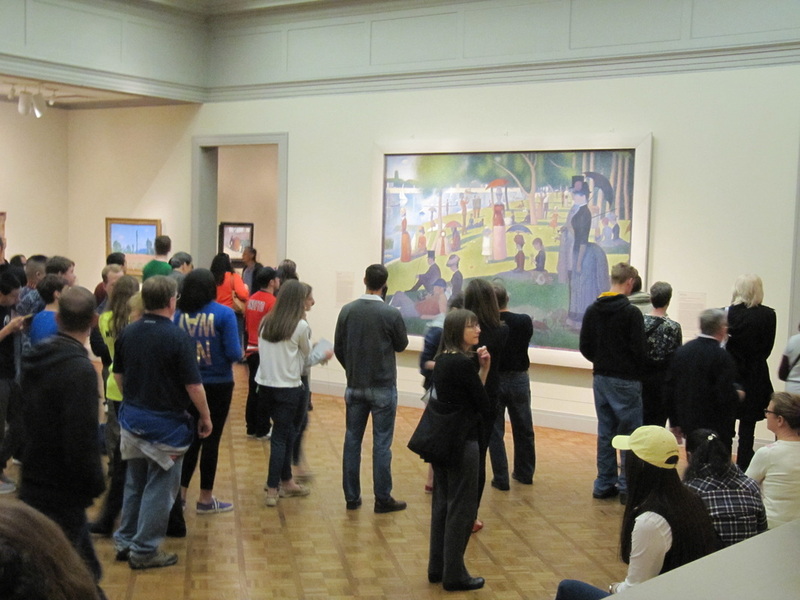 The painting, Sunday Afternoon on the Island of La Grande Jatte is very big. It is nearly 7 feet tall and 10 feet wide. The painting is displayed at the Chicago Art Institute.